Allow our cedar roof maintenance and repair team to give your damaged roof the revitalization it needs. At Cedar Preservation Specialists, our team will ensure your roof gives your home the distinctive style and protection it deserves with our maintenance and repair services. 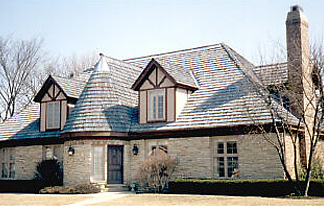 Nothing matches the strength, durability, insulation properties, and beauty of cedar roofing. However, it does require maintenance when there are signs of deterioration. That's where our cedar roof repair and maintenance team comes in. Our experts are able to remove shakes or shingles that are curling, splitting, cupping, shrinking, or swelling so that your roof lasts as long as possible. It's important to note that we have seen cedar roofs as young as 12 years that are too deteriorated to benefit from our process. For proper maintenance and to protect and prolong the lives of cedar roofs, we recommend treatments every four to six years. Materials used on our jobs consist of cedar shakes, cedar hip and ridge caps, and cedar shingles—all #1 grade per recommendation of the Cedar Shake and Shingle Bureau. For treatment, we use an environmentally safe preservation product, called Sta Brite® R, which comes in three colors: cedar tone, organic brown, and medium grey. Once treated, we give a five-year transferable guarantee against missing or loose shakes and ridge caps and also against moss growth. Since the earliest days of North American colonization, homeowners have chosen cedar roofs for their warmth and charm and, even today, cedar is still one of the most resilient roof coverings available. In this modern day and age, however, according to Mike Vaille of the Cedar Shake and Shingle Bureau, many Midwestern homeowners aren't aware of the maintenance that cedar roofs need. "Cedar roofs have been around forever on the Coasts," notes Vaille, "but they've only recently become really popular in the Midwest. Unfortunately, our organization has found that information on how to care for them isn't spreading nearly as fast as their installation." Vaille explains that lack of maintenance can be especially detrimental to a cedar roof in the Midwest because the climate is so tough on the cedar. The good news is that you can protect your cedar roof from these and other threats through proper maintenance, and even if your cedar roof is already showing signs of deterioration, it may still be restorable.